One of the most important parts of Waterloo’s co-op program is that the school requires each placement be paid. Without meeting certain minimum requirements for compensation, a student can’t claim academic credit for their internship, and without five internships, they can’t graduate. This results in Waterloo co-op students being able to pay their tuition in full (hopefully) each semester. In disciplines like Software Engineering, where demand is at an all-time high and many students are skilled enough to hold their own at Silicon Valley tech giants, many students end up negotiating for higher salaries at their internships. To help visualize this financial situation and aid younger Software Engineering students in planning their future, I decided to create a little tool: the SE Calculator. 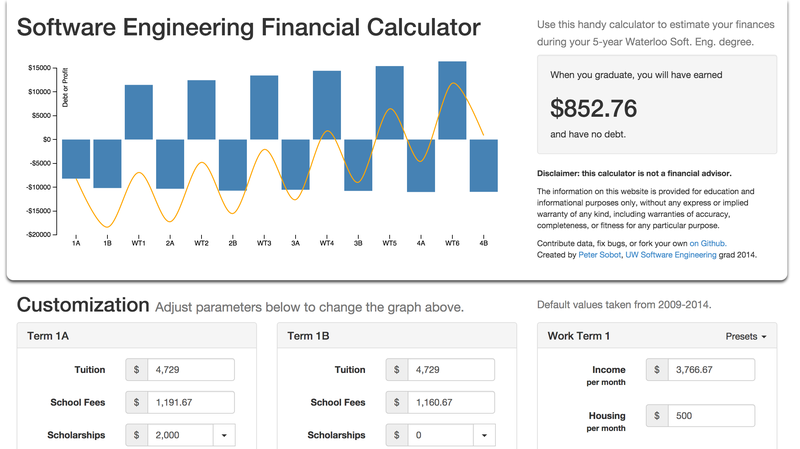 This simple, free, open-source in-browser tool allows you to calculate and visualize how much money you’ll earn or owe at the end of a five-year Waterloo Software Engineering degree. While it’s not rigorous (and should not be used as a financial advisor) it has helped me visualize how much money I’ve earned and spent during my academic career. The site also stores your data in the URL string, because – well, simply – I wanted to store the data somewhere quick and easy. Bookmark the page once you’ve plugged in some values and store multiple datasets in your bookmarks bar. If you’re a Software Engineering student (or will soon be one), I hope you find the tool useful to you. If you’re a student in some other Waterloo Engineering discipline, or in Computer Science, hopefully most of the fields still apply to you and you might get some utility out of the tool as well. If you’re interested in customizing the tool - to add new presets, to adapt it to your own academic situation, or just to fix bugs - please feel free to fork it on GitHub. The tool runs almost entirely in-browser with Angular.js and uses Gulp as a build tool. Happy hacking!